One of the first plants to bloom in my garden is winter aconite. It usually starts blooming in February and continues into March. I treasure its cheery yellow flowers with their shiny green collars because they brighten what can otherwise be a cold and dreary time of year. When my original winter aconite plants got this big, I was thrilled. 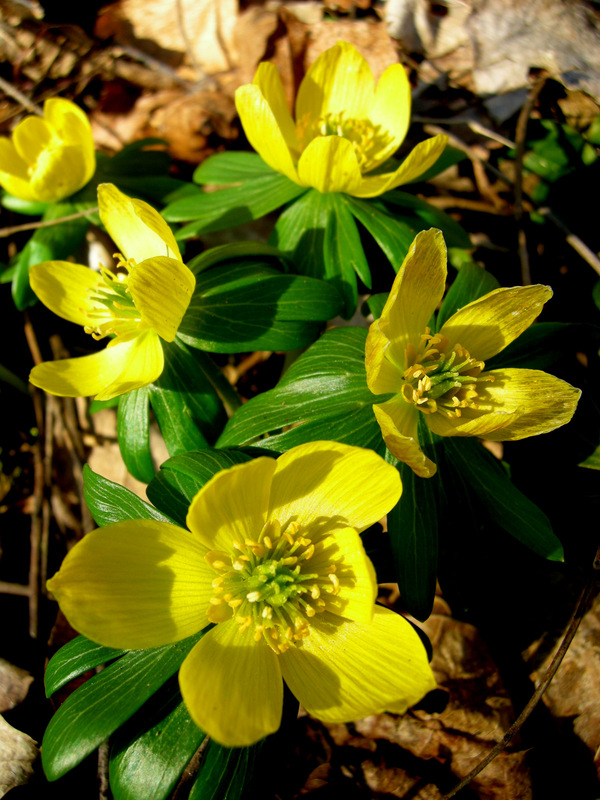 Winter aconite is in the buttercup family and is native to Europe. It is about four inches tall and prefers woodland soil in deciduous shade. It wants to be cool in the summer but not too dry, and it will not tolerate wet soil. It grows in zones 3 to 7. 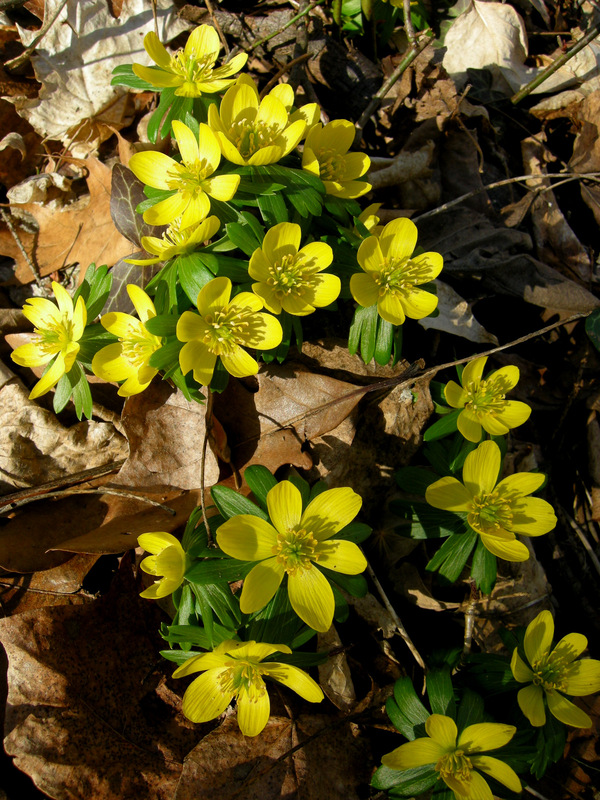 Winter aconite is a bulb (technically a tuberous rhizome) and goes dormant when the weather gets hotter. Some sources state that it is poisonous to humans, but there have been no reported incidents. It is deer resistant and black walnut tolerant. When the patch started to fill in like this one I was ecstatic. You can order winter aconite as a dried bulb. It is recommended that the bulbs be soaked overnight to increase success. Despite soaking, I never got more than one or two bulbs to grow into plants. I tried several times. Then a friend of mine gave me some growing plants (thanks Julie! ), and my little patch of winter aconite began in earnest. After several years, my patch looked like this. 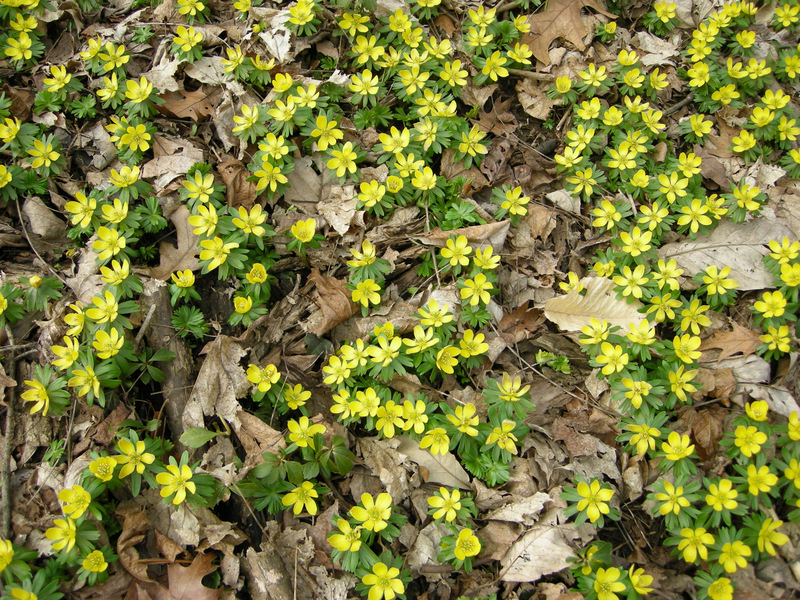 Winter aconite naturalizes well once you get the initial plants going. The best way to spread it is to collect the seeds and sprinkle them where you want them. If you don’t collect the seeds, they tend to germinate around the base of the mother plant. My winter aconite has been so successful that, after ten years, I was able to sell growing plants in my snowdrop catalogue (although next year I need to give the patch a “rest”). 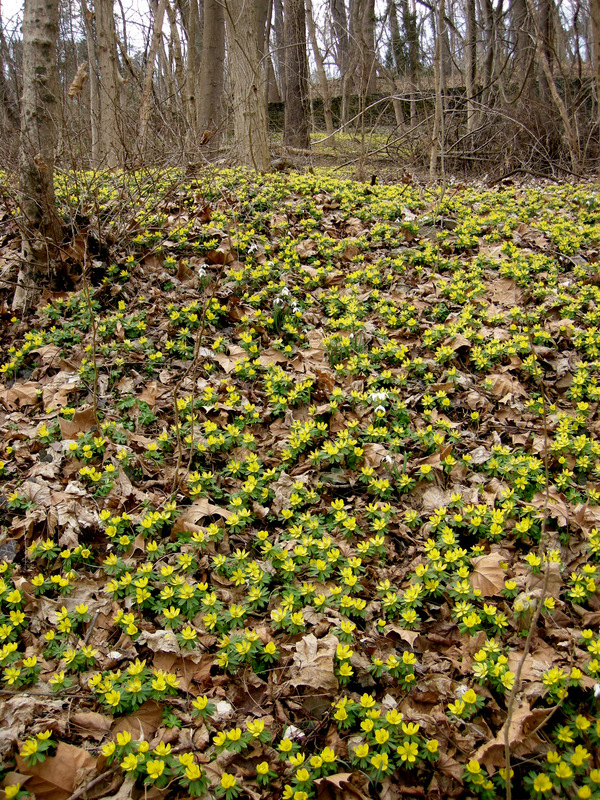 Winter aconite covers this much ground in my woodland. Now we get to the “wonder of nature” part. Right down the street from my plant nursery is a public park owned by Radnor Township (Pennsylvania, US) called Ithan Valley Park. The property was originally an old Main Line estate. During the early 1900s, it was owned by the botanist John Evans, and he maintained an arboretum of exotic plants there. Evidently his collection was amazing, but today few of the original plants remain. 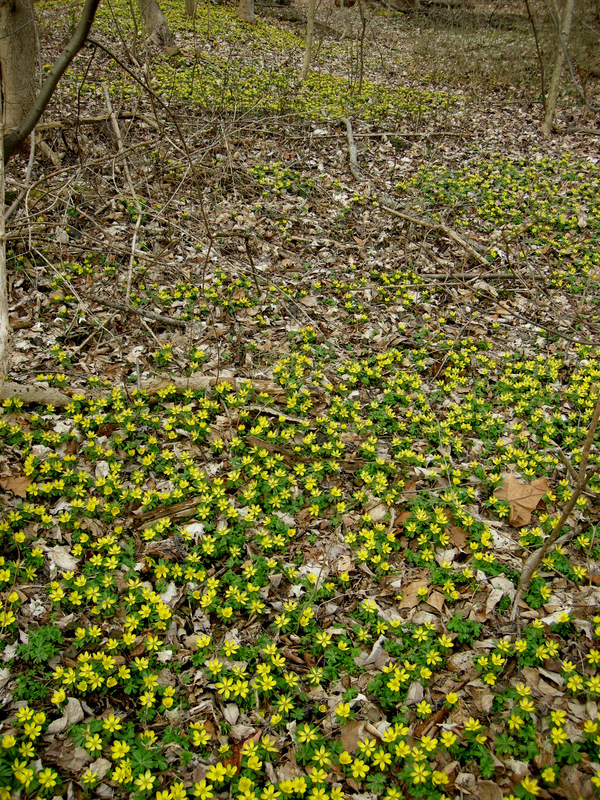 At some point John Evans planted winter aconite on his property. 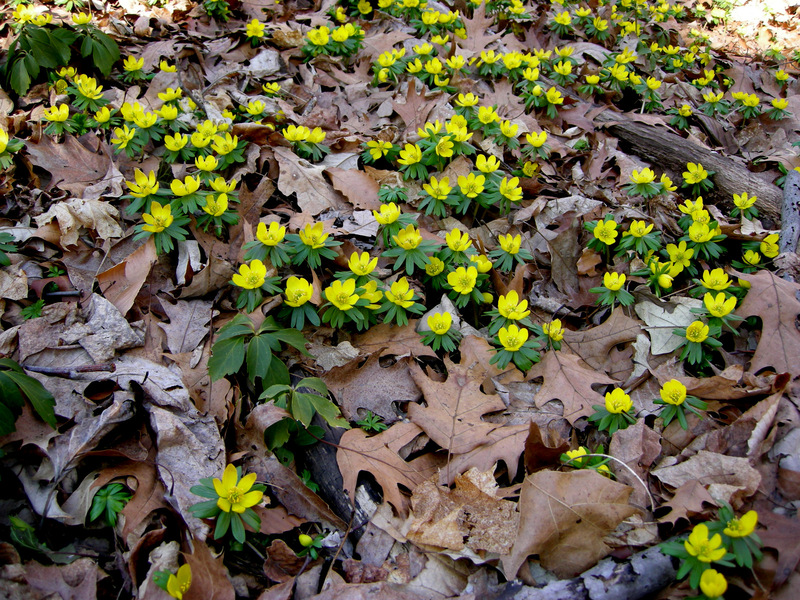 The conditions there proved to be ideal with the cool, moist woodland soil and deciduous shade that winter aconite loves. 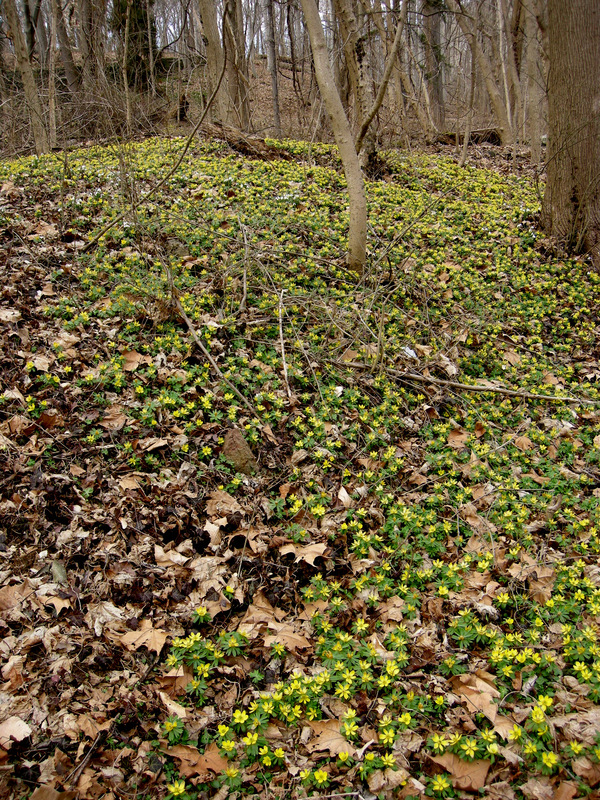 Today Ithan Valley Park is covered with sheets of winter aconite every February and March. There is so much yellow that I think it must be visible from outer space. It truly is a wonder of nature that I want to share with you. The winter aconite in the park grows thickly. The stone wall of the old estate is in the background. To truly appreciate the spectacle, you need to visit in person (I apologize to my non-local readers). Ithan Valley Park is located at 642 South Ithan Avenue, Bryn Mawr, PA 19010, at the intersection of South Ithan and South Roberts Roads. 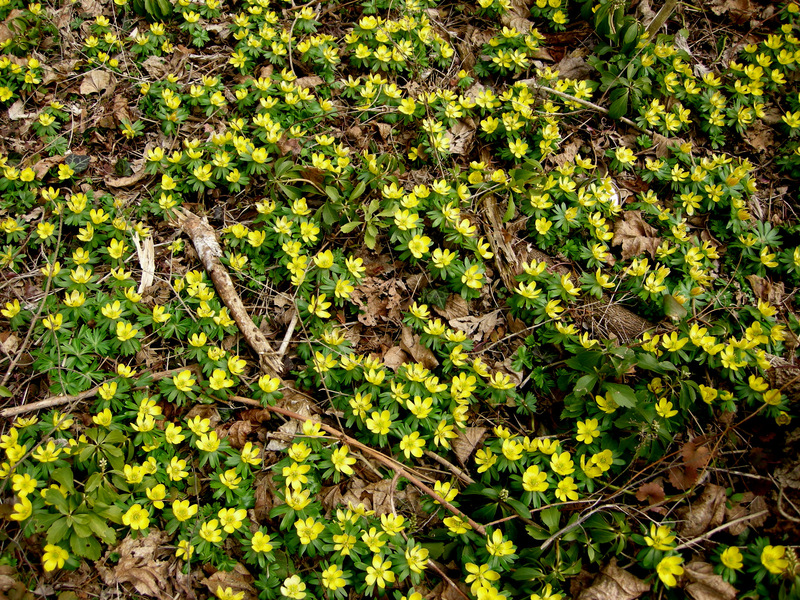 Time is of the essence because the winter aconite will only be blooming for a few more days. I am linking this post to the Winter Walk-off 2012, which is a challenge by Les at A Tidewater Garden to share what can be seen within walking (or biking) distance of your home. Every photo in this post was taken at Ithan Valley Park, 8/10 of a mile from my house. Facebook: Carolyn’s Shade Gardens now has a Facebook page where I can post single photos, garden tips, and other information that don’t fit into a blog post. You can look at my Facebook page here or click the Like button on my right sidebar here. Calendar: If you would like to look at my photos all year round, please consider buying my 2012 calendar, available worldwide. For details, click here. Nursery Happenings: The 2012 Hellebore Seminars are now available for registration. The March 19 seminar is sold out, but there are still two spaces on March 16. To view the brochure, click here. To view the 2012 Snowdrop Catalogue, click here. I am currently accepting orders—snowdrops are available mail order. 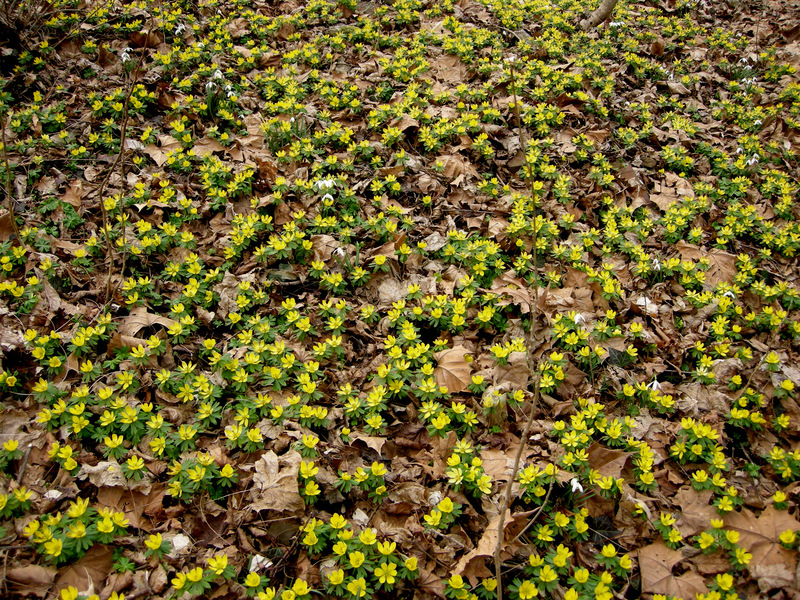 This entry was posted on February 21, 2012 at 8:10 am and is filed under bulbs for shade, garden to visit, Shade Perennials, winter, winter interest with tags Carolyn's Shade Gardens, Eranthis hyemalis, Ithan Valley Park, winter aconite. You can follow any responses to this entry through the RSS 2.0 feed. You can leave a response, or trackback from your own site. Winter aconites and pretty much all very early blooming bulbs or perennials are quite amazing! Coming through partly frozen ground, enduring heavy frosts and random weather extremes only to shake it all off and continue blooming! Gotta love plants like these! I’ve not tried winter aconite before. I have an area of deciduous woodland at the bottom of the garden, but it gets very dry in summer. But after seeing your photos, I might just give them a try. Wow that is quite a sight. I love these little flowers as their blooms are so cheery. I planted them a few years ago here but they have not done well at all but I sure do like the cheerfulness of them. So many! I’ve been seeing pictures of these, and I just love them! Too bad they don’t grow in my zone. “Likes cool summers” means they would hate my area! 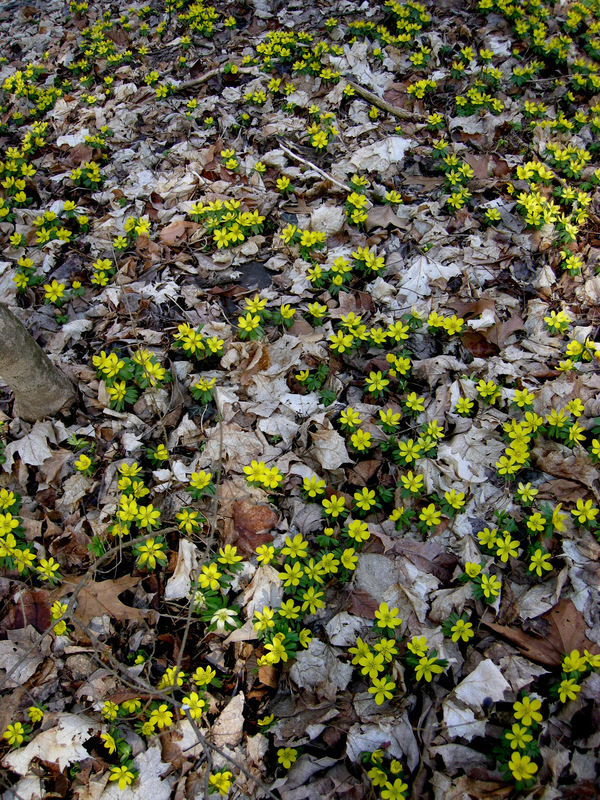 But, I enjoyed seeing this carpet of beautiful yellow. When I was a kid my mother would encourage us to gather the seeds of the winter aconites and scatter them wherever we wanted to, since these little plants will easily grow in a herbaceous border, under an apple tree or wherever, and this meant that we had aconites all over the place. A cluster here, a clump there. Oh, and by the way: Your pictures of the Ithan Valley Park remind me of the way our local deciduous forests look in April/May when anemone nemorosa covers the forest floor. I must put this in my calendar so I remember to get out there and enjoy our own local wonder! It’s a stunning sight when you come across a piece of woodland where the ground is covered in white! 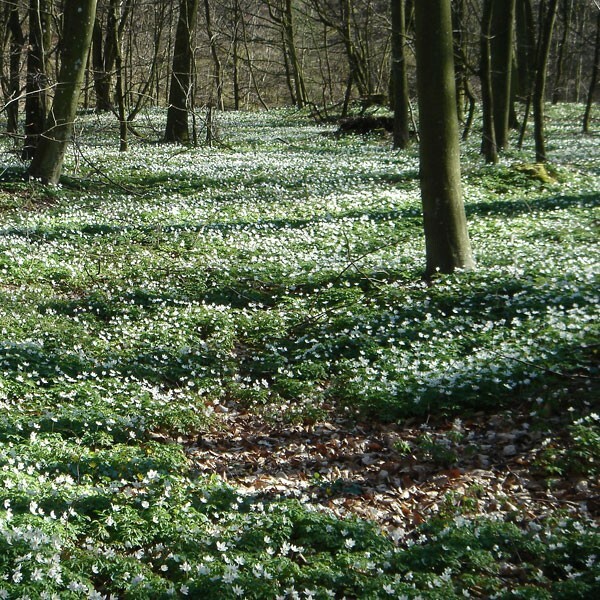 -Where winter aconites tell us that spring is on its way, the white anemones tell us that spring is definitely here and summer is just around the corner! And now that I’m up in my garden I can see the proof of my claim that we were allowed to scatter aconite seeds all over the garden as kids; nearly all of the perennials that I’ve transplanted from my mother’s garden have a small patch of winter aconites growing amidst the spent stems of last year’s flowers!!! 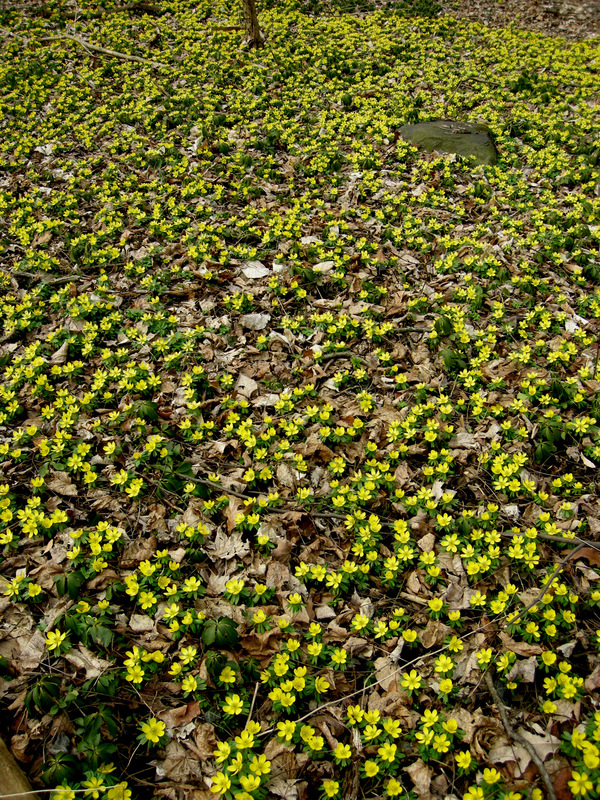 Just a few, but still… There are aconites in 8 different spots in my garden, and surely they will spread over time. Your drifts make my one little plant look absolutely pathetic! Will follow your advice and try sprinkling seed when they are formed, maybe eventually I will have drifts like yours! What a colorful treat for winter, looks like a natural tapestry! The photos remind me of bluebell woods in the UK. Do you have winter aconites first and then bluebells after ? 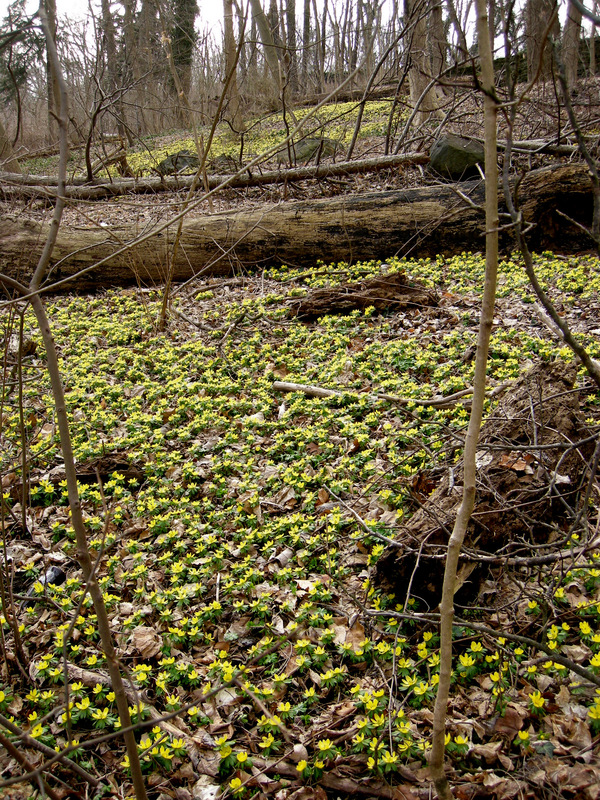 These are stunning images of the impact of naturalised aconites. By coincidence we’ve just ordered some in the green to have a go. How truly beautiful!! This is a carpet of true joy to see! The wonders of spring!! Enjoy!! I enjoyed all those Winter Aconites so much, Carolyn, especially as I can’t grow them; “cool” and “Summer” just don’t go together here. Wow, those cheerful winter aconites really are a wonder! 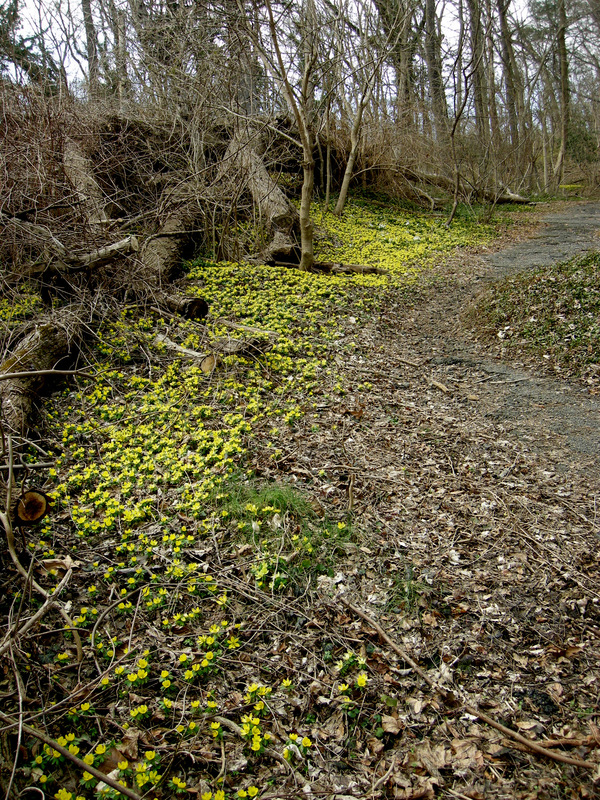 Recently someone who has not followed my blog before was trying to identify my moss path and asked if it were a stream of winter aconites. Looking at your trail entrance photo, I can see how he asked that. The park at the end of Roberts road is a lovely place. 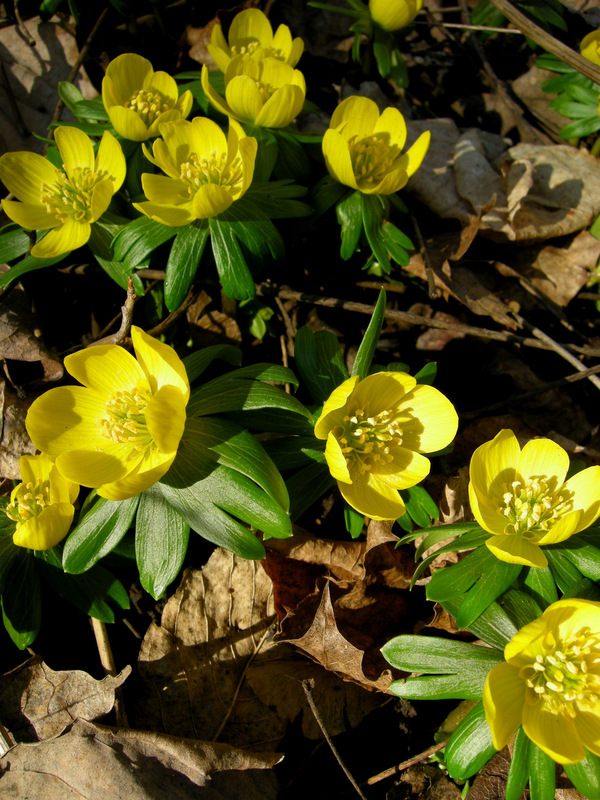 Have you noticed the fragrance of the aconite? Very subtle, but wonderful this time- anytime of year. And soon…the Scilla will appear! I’ve never seen winter aconite in bloom before. Now I have – virtually. I do love carpets of flowers. Trout lilies bloom like that in places in the woods in central N.C.Thanks for sharing. It looks like the plant would do well in the conditions I have, as long at it had full shade from summer heat. Thank you Carolyn for this lovely post. Winter aconite has long been a favourite plant of mine and you’ve reminded me that I have yet to plant it in our new garden. That is quite a show. Very pretty when plants populate like that. Thank you for participating in my Winter Walk-off, especially with such a wonderful flower. I love when things naturalize with abandon, especially if it is something that is only around a brief time then disappears. That makes them kind of magical. I don’t believe these would be hardy for me, so I will have to enjoy them from afar. These are adorable! I never heard of winter aconites before. Great article about an underutilized bulb, which I showcased myself not long ago since it is also deer resistant. It is very popular in my native England, typically blooming in January before the common snowdrops. It is so low to the ground that it really does look like a carpet of gold. Thanks for the memories. Mmmm, gorgeous, that is the way t grow these bulbs. I have tried a few times myself, using the dried bulbs (soaked of course). I wish that they were sold in the green in North America like the UK. Why are our commercial growers not selling these, and snowdrops, scilla, etc.? There is certainly a market for is, as you are finding out. Lady Bonham Carter used to have aconite parties at her house in England and give them away to all her guests. Certainly the best way to start them in your garden. I have seen these in garden beds but never in such a display across the forest floor…stunning! They are really a great way to add interest in the forest and in garden beds. Thanks for this idea! 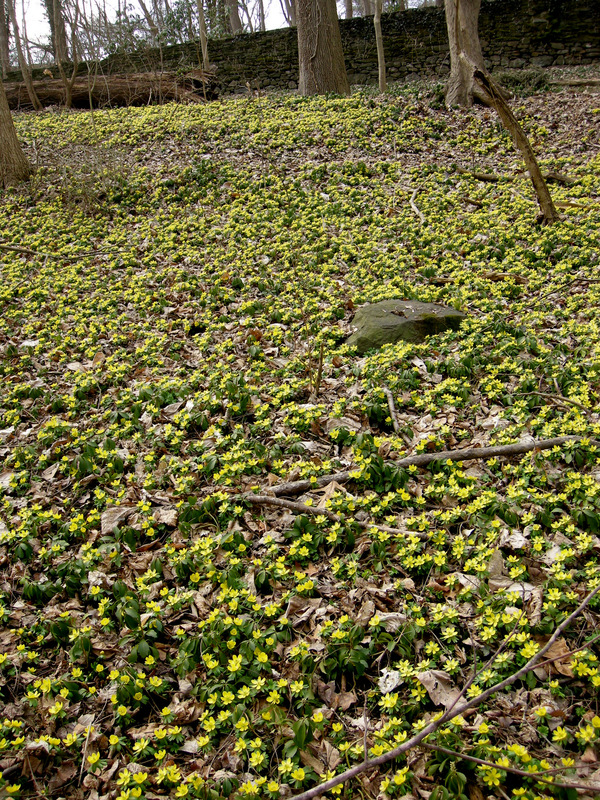 I recently came across a carpet of winter aconite lining a trail in the Crum Woods of Swarthmore, part of the Scott Arboretum, and was delighted. That’s it — the Wister Garden. I’m looking forward to seeing what comes up next! Love to see all the cheery yellow, Carolyn! I can only imagine how beautiful that would be in person. If I’m ever in Pennsylvania, I will try to remember to check it out. Beautiful! I must start a patch of this. I remember Buttercups blooming close to my home in Wisconsin when I was a little buttercup myself. Just loved walking through the waves of aconite! I’ve heard of this plant before but have never seen it. Beautiful!! Just wondering, does the park allow dogs on leashes? Carolyn, you always introduce me to such delightful plants. You know of course I’ll have my eyes wide open at the local nurseries in case they have it! Lovely! I have never seen this but it sure is cool looking. Reminds me of bluebells in the effect… wrong season and different color but for some reason reminds me. 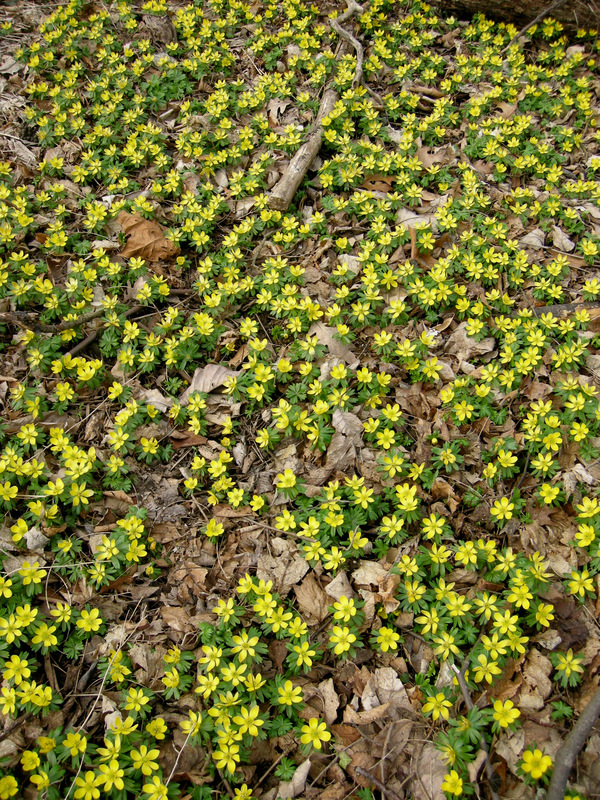 I have a question-when you sprinkle aconite seeds is it better to do so on the leaf mulch, or bare ground?